"Now you see me, now you don't, now you see me ..
"Hey Hey we're the Monkees...oops wrong band"
They look like the Beatles, but they're actually All Saints. And with all of his wisdom, St Peter, the first Bishop of Rome, looked upon on his spiritual home and declared..."For god sake John, get rid of Yoko, She's a C**t"
The first two must use Daz. It's not all black and white ... here we have Papal Reign. 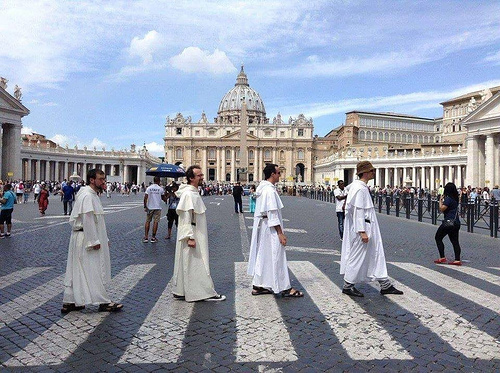 A group of Benedictine monks was arrested for impersonating the Ku Klux Klan celebrating the 50th anniversary of the White Album. They protest they're Innocents. Why wouldn’t you trust men who wear dresses with small children? In this alternate universe The Beatles play mostly gospel music, and Ringo is a good song writer. Why did the Catholic cross the road? "On second thought, kids, STAY AWAY from the crosswalk." "Well it looks like all roads do lead here." Sad news but they have now crossed over. "Don't rush, don't rush, the new altar boys don't arrive till vespers." Some Monks have dirty habits. "Nice of Francis to stop his Pope-mobile for us, I just hope he knows how to work my camera." *whoosh* "Did somebody say 'Little Child'?" "For God's sake Paul, I said let's go and score some more dope!" Just around the corner from Abbey Road is Basilica Street. "And to think it all started outside an Abbey"